Ivory joked and laughed about Michael Cole being "Heidenreich's man" which sounded unscripted and not proper..
INTERVIEW: Josh Mathews & Billy Kidman (Says he's going to start looking out for himself and nobody else)..
VIDEO PACKAGE: John Cena on set talking about his photoshoot with one of the "Muscle" magazines.. BACKSTAGE: Kurt Angle arrives at the building flanked by Luther Reigns and Mark Jindrak..
WWE.COM INTERVIEW: John Mathews & Booker T (Says there's no way in hell he's losing the US title).. 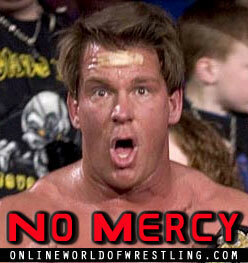 MATCH: Mark Jindrak squashed Scotty Too Hotty (THIS was supposed to hype up the crowd?!).. GRUDGE MATCH: Eddie Guerrero defeated Luther Reigns w/Mark Jindrak..
Eddie Guerrero used a baton from a police officer at ringside (tribute to Big Bossman) as a foreign object..
Eddie Guerrero followed by by hitting the frog splash and scored the pin to win the match! BACKSTAGE: Dawn Marie told Miss Jackie that her marriage won't last long..
CW TITLE MATCH: Spike Dudley w/The Dudleyz defeated Nunzio to retain..
Bubba Dudley interfered and helped Spike Dudley retain his championship..
GRUDGE MATCH: Billy Kidman defeated Paul London..
Billy Kidman tried to walk out on the match but eventually returned to the irng..
Billy Kidman won after hitting the Shooting Star Press, which caused London to bleed from the mouth..
Paul London was placed on a backboard and Billy Kidman did a second Shooting Star Press onto him! TAG TITLE MATCH: Kenzo Suzuki & Rene Dupree defeated Rob Van Dam & Rey Mysterio to retain..
GRUDGE MATCH: The Big Show defeated Kurt Angle..
Kurt Angle walked out and lost by COUNT OUT but Theodore Long ordered him back into the ring..
Kurt Angle brought out the tranqualizer gun but The Big Show got it and broke it.. The Big Show gave Kurt Angle a chokeslam and pinned him to win the match.. US TITLE BEST OF FIVE SERIES FINAL: John Cena defeated Booker T to capture the US title! 6-PERSON TAG MATCH: Rico & Charlie Haas & Miss Jackie defeated The Dudley Boyz & Dawn Marie..
WWE TITLE LAST RIDE MATCH: John Bradshaw Layfield defeated The Undertaker.. The Undertaker did a tombstone piledriver onto the ring steps, busting JBL open bloodied.. The Undertaker later chokeslammed JBL through the Spanish Announce Table..
John Heidenreich jumped out of the hearse with a towel doused in ether and put it on Undertaker's face..
Undertaker actually survived that, got out of the hearse, but JBL gave him a clothesline from hell! JBL and John Heidenreich loaded the Undertaker into the Hearse, giving JBL the victory! Paul Heyman was the driver of the hearse, and Heidenreich rammed a truck into the hearse..
We are to assume the Undertaker is "DEAD" now..